The Poderino farmhouse is a typical Tuscan country home on the Florentine hills about 8 km the city center. The farm, pond and Chianti hills covered with the family olive grove are all at your disposition during your stay at Poderino. The one bedroom vacation rental, has its own private entrance, a panoramic terrace and a delightful garden and gazebo for its sole use. The holiday apartment, is located close to shops, restaurants, major roads for traveling Tuscany & buses to Florence. The apartment is located on the first floor of the farmhouse and has its own private access. There are four rooms: a full size living room with TV and sofa bed, a double bedroom with closet and french doors to the front terrace, a bathroom with tub and an eat-in kitchen, fully equipped to make your favorite Tuscan meal.The apartment has Wi-Fi internet access for anyone with a laptop or phone with access. The views from the sitting area into the countryside are beautiful. The sofa turns into a sofa bed to accommodate two additional adults or children. The apartment is very comfortable and while not extremely luxurious, it offers all of the amenities required to make a stay here relaxing and special with the welcome offered by Andrea and his family and the charm of being in beautiful Tuscan countryside. The rates for the apartment include the linen, cleaning and any use of heating and electricity. Animals are not accepted and the apartment has a no smoking policy. The minimum requeted is one week, however is low and midseason shorter stays are possible upon request. The apartment was renovated using natural building materials such as local stone and wood to maintain the original look. The interiors are furnished following typical Florentine style. The Poderino farmhouse is located just a few kilometers from Florence and its main attractions. Guests at Poderino can spend the day in Florence enjoying its museums, churches and main tourist attractions while being able to head back to the quiet and relaxing atmosphere of the apartment in the hills of Florence. The location is particularly convenient, located only a few minutes from Grassina, a busy little town with shops, restaurants, gelaterias and easy access to public transport going into Florence and Chianti. 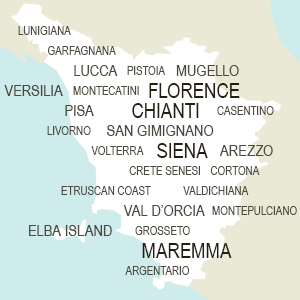 The major roads to Pisa, Siena, Arezzo and San Gimignano are less than 5 km from the apartment. Andrea and his family live and work at the Poderino and are available to assist you during your stay including information reguarding itineary, local information. Plan easy day trips for wine tasting, bike rides and horseback riding in the area. The true beauty of Poderino, is to find yourself in absolute tranquilty close to nature while staying only minutes from all the major monuments and beautiful cities of Tuscany.